VI.16.7 Pompeii. May 2006. Room E, tablinum. Looking west from atrium. 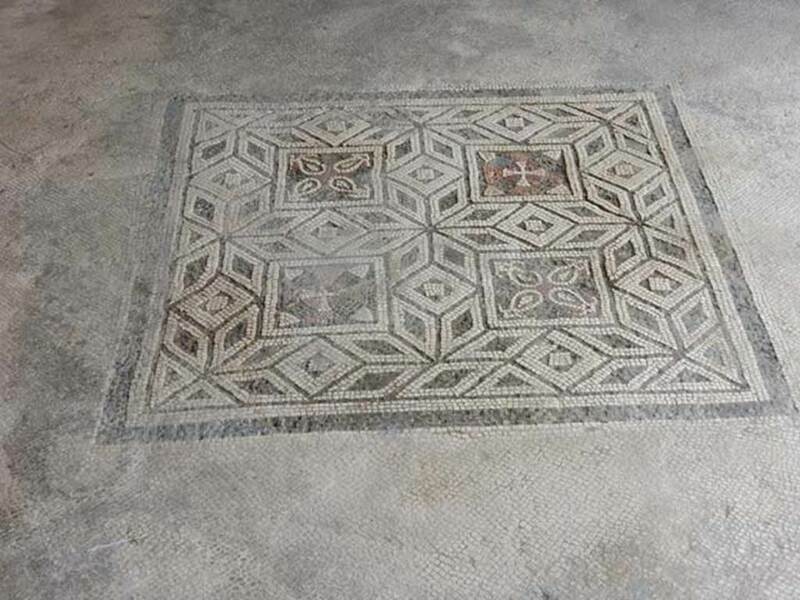 VI.16.7 Pompeii. May 2016. Room E, looking west across tablinum. Photo courtesy of Buzz Ferebee. 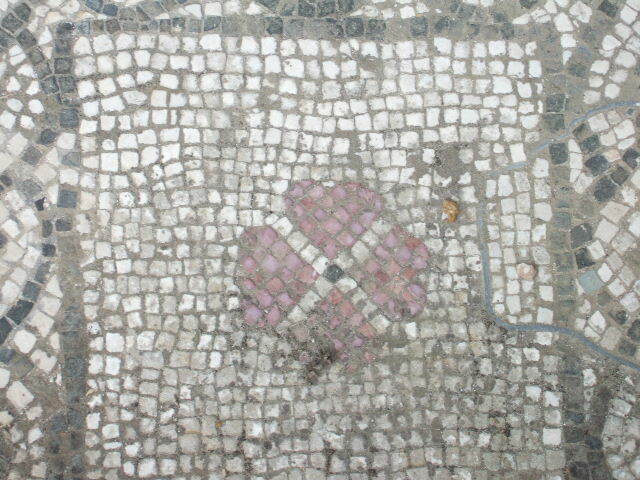 VI.16.7 Pompeii. May 2006. Room E, tablinum. Looking west. VI.16.7 Pompeii. May 2016. 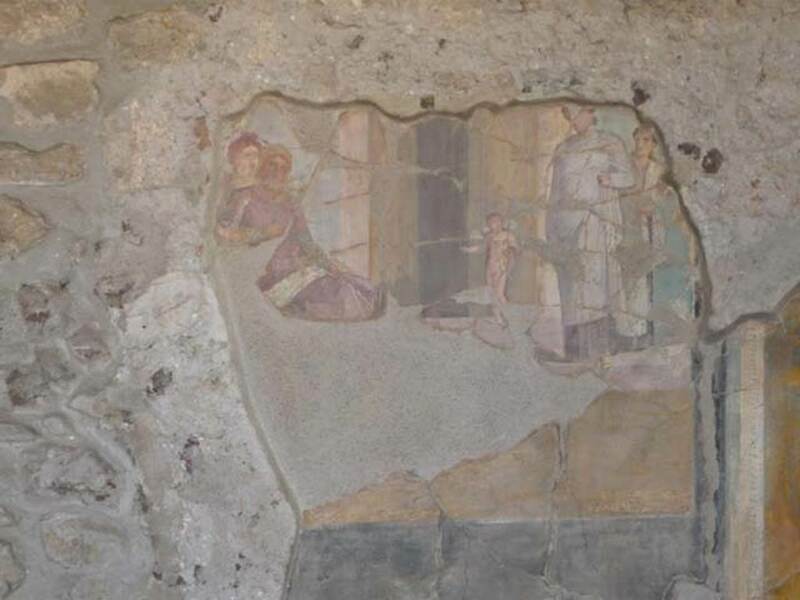 Room E, wall painting of Paris and Helen at Sparta on west wall of tablinum. 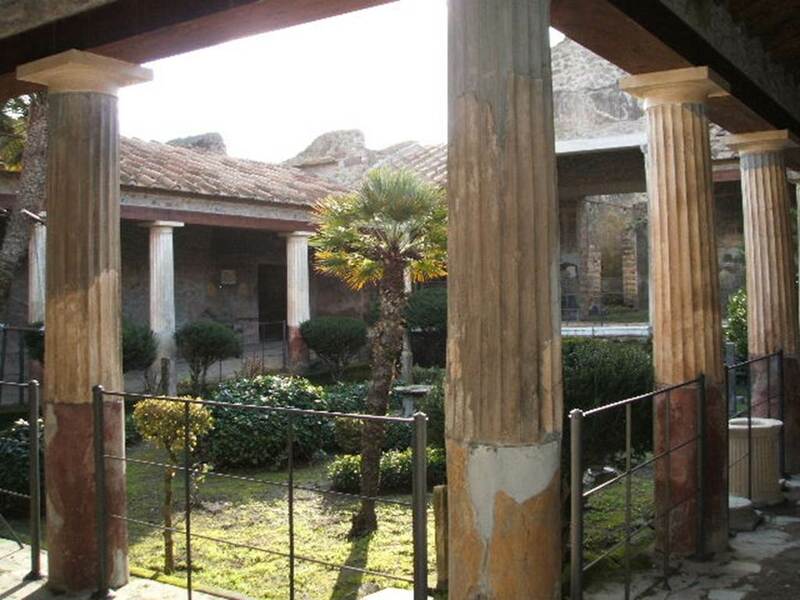 VI.16.7 Pompeii. June 2013. 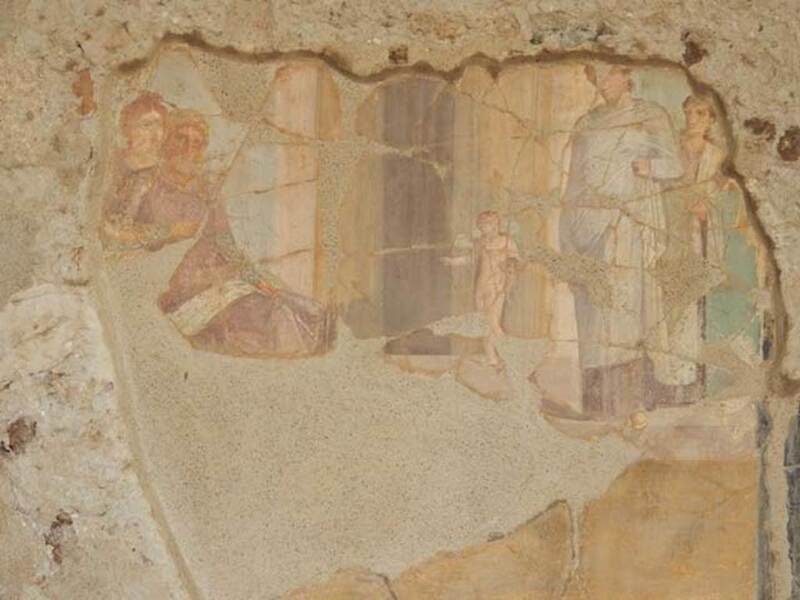 Room E, remains of wall painting of Paris and Helen at Sparta on west wall of tablinum. 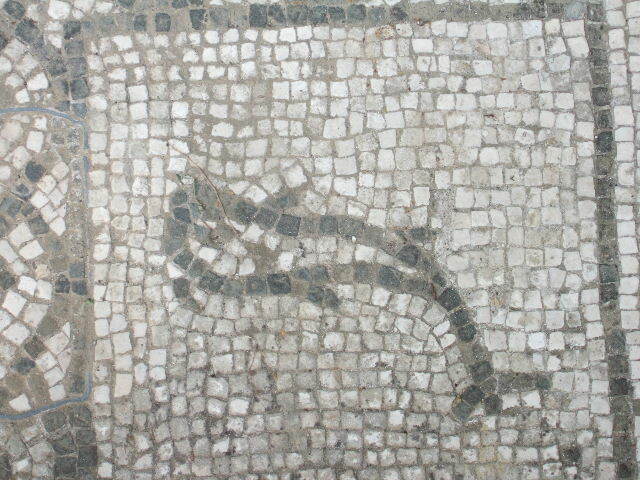 VI.16.7 Pompeii. May 2006. 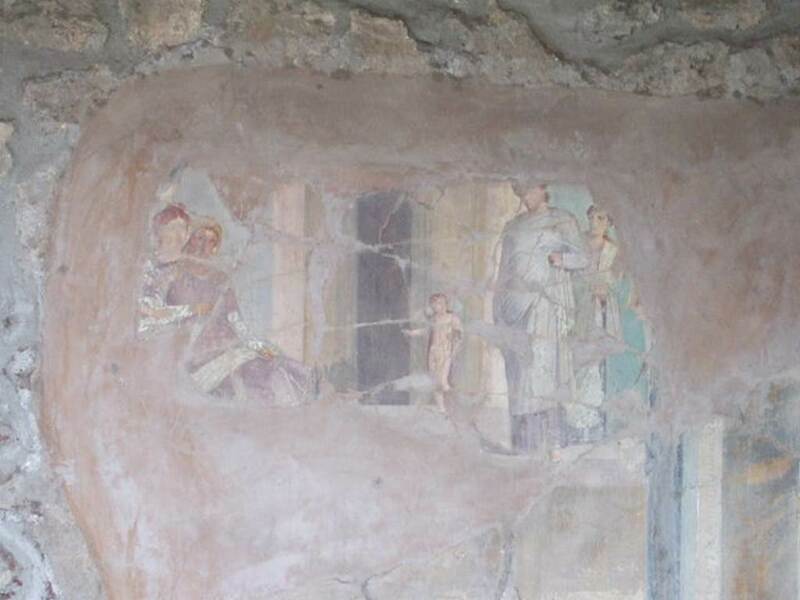 Room E, remains of wall painting of Paris and Helen at Sparta on west wall of tablinum. 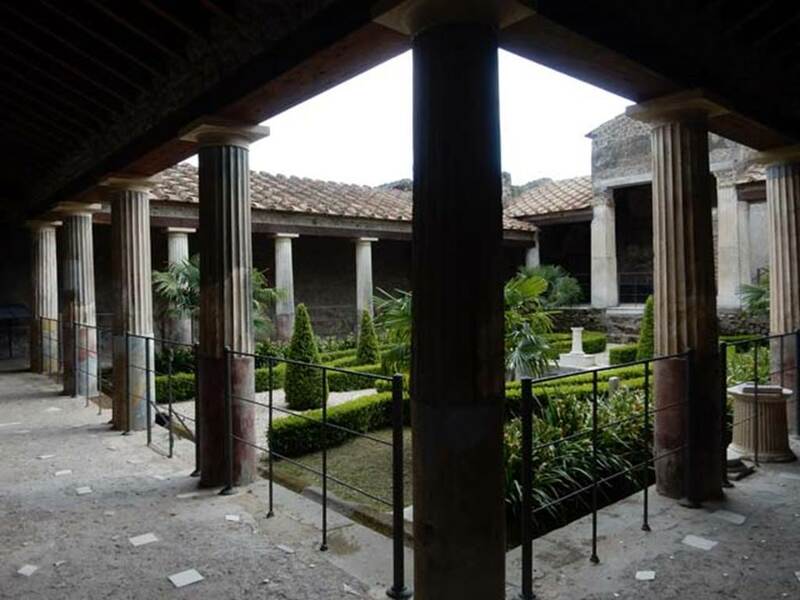 VI.16.7 Pompeii. May 2006. Room E, north-west corner of tablinum. 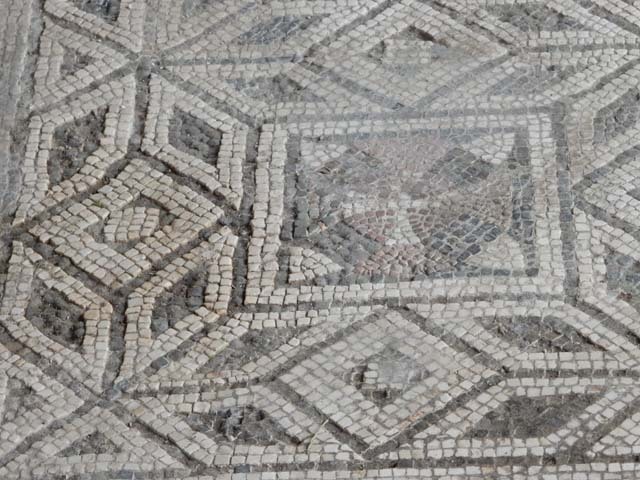 VI.16.7 Pompeii. May 2016. 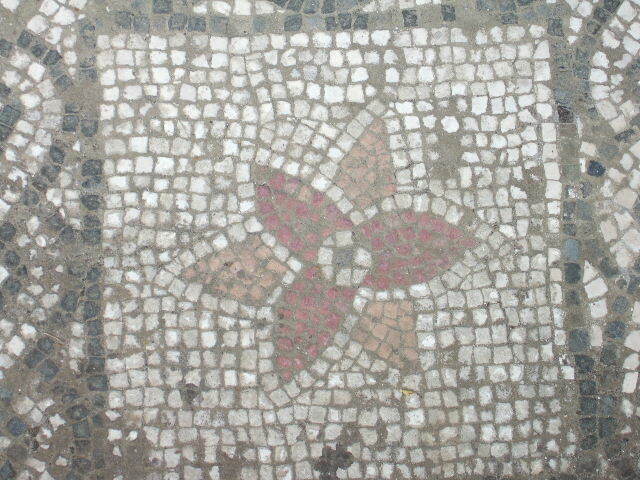 Room E, mosaic floor in centre of tablinum. Photo courtesy of Buzz Ferebee. 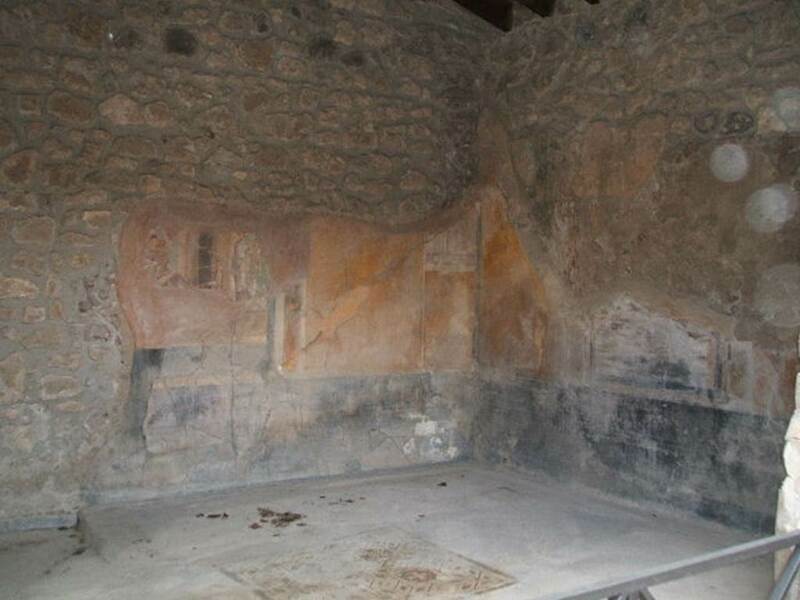 VI.16.7 Pompeii. June 2013. 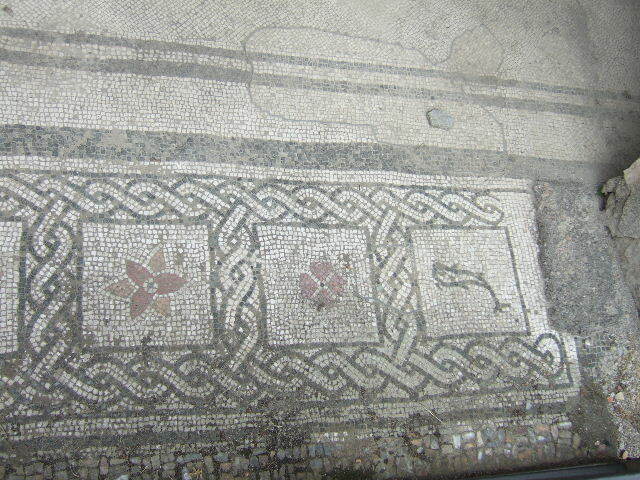 Room E, mosaic floor in tablinum. Photo courtesy of Buzz Ferebee. 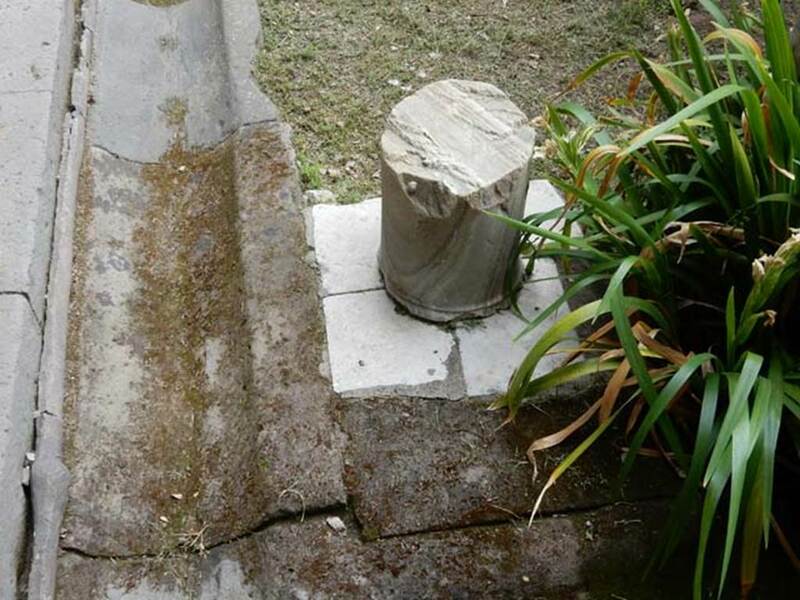 VI.16.7 Pompeii. May 2006. 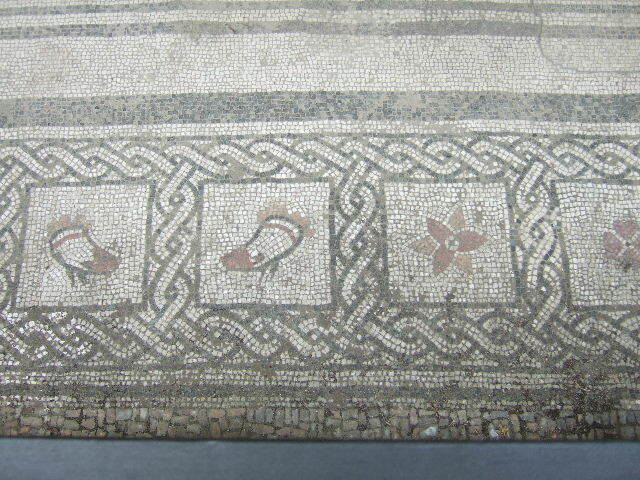 Room E, mosaic floor in tablinum. 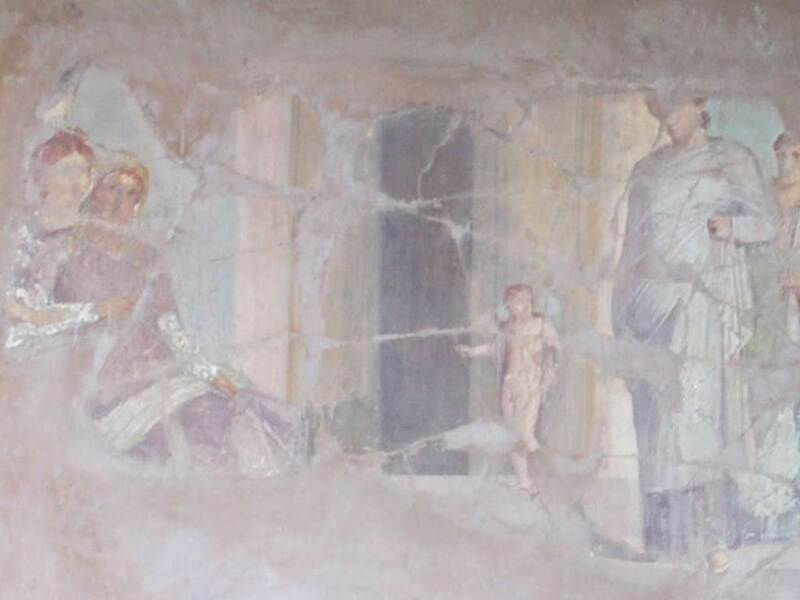 VI.16.7 Pompeii. May 2006. 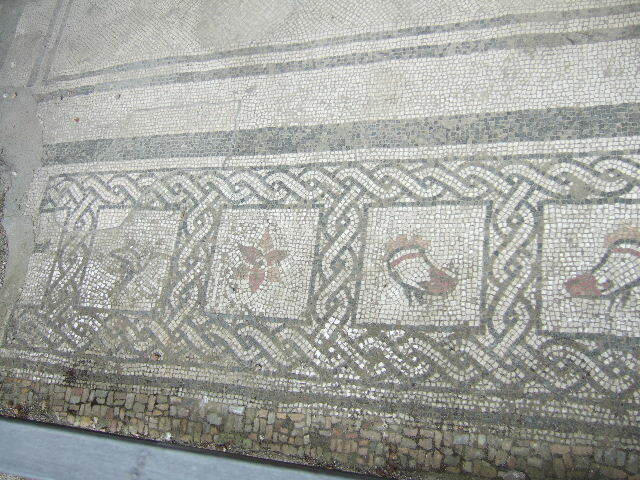 Room E, centre panel of mosaic floor in tablinum. 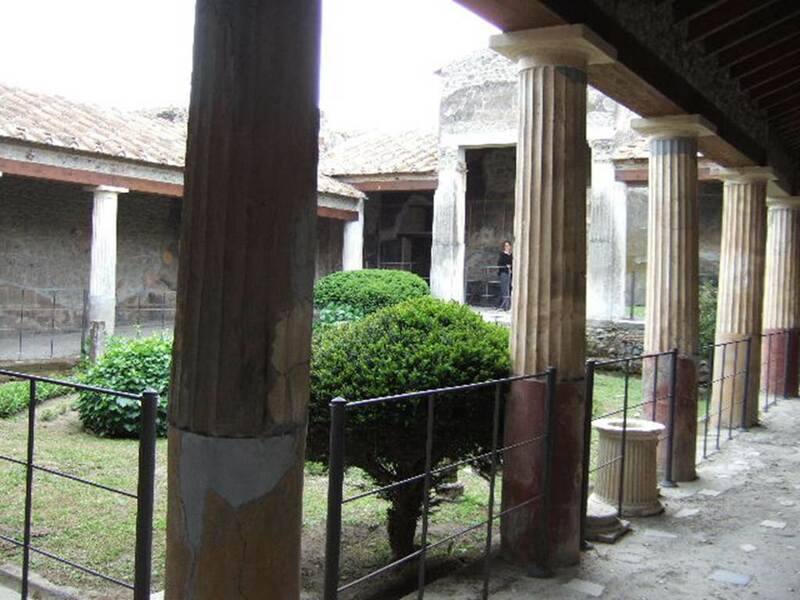 VI.16.7 Pompeii. May 2016. 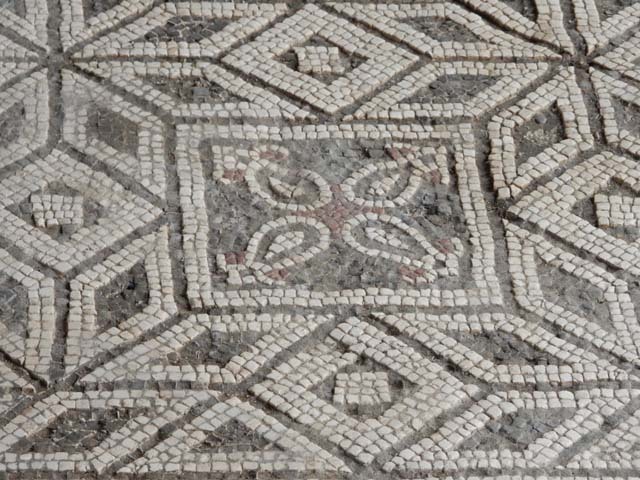 Room E, detail from centre mosaic. Photo courtesy of Buzz Ferebee. 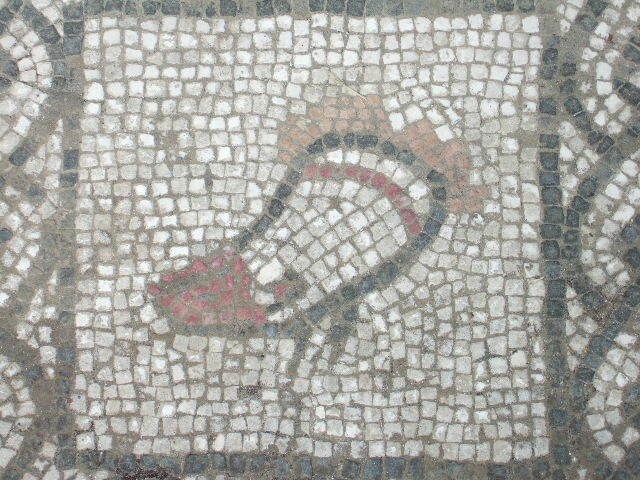 VI.16.7 Pompeii. May 2016. Room E, looking towards north wall of tablinum. Photo courtesy of Buzz Ferebee. 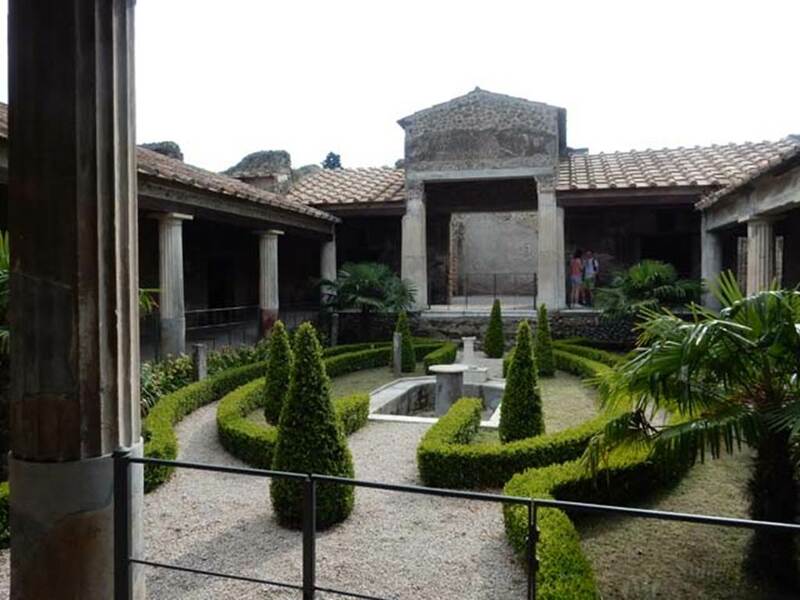 VI.16.7 Pompeii. May 2006. 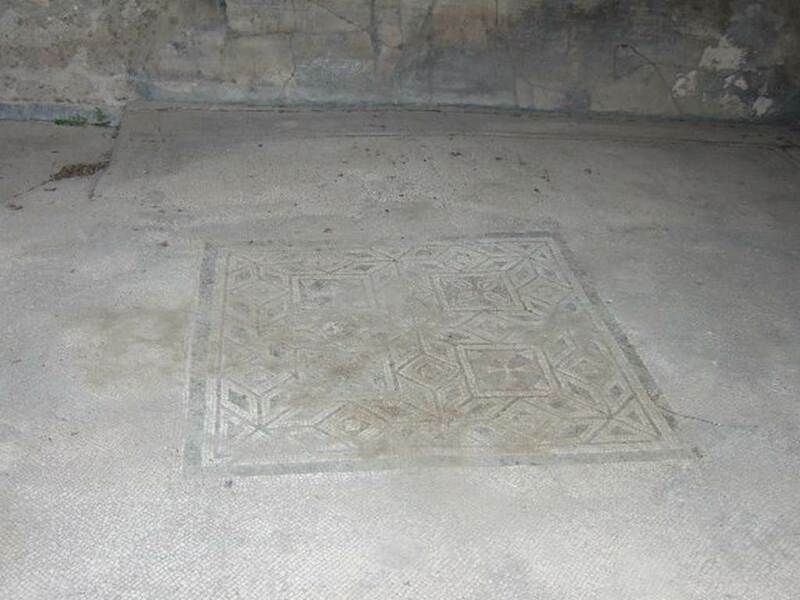 Room E, mosaic floor doorway threshold in tablinum. 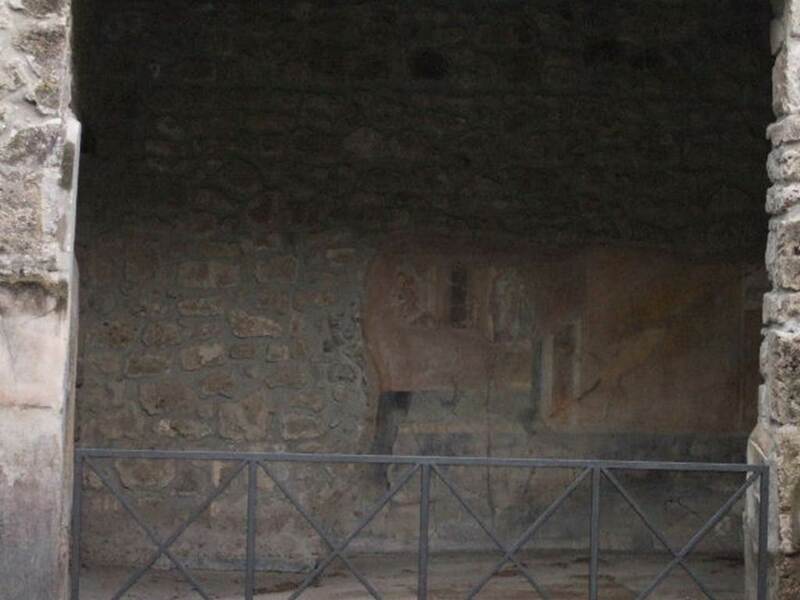 VI.16.7 Pompeii. May 2006. 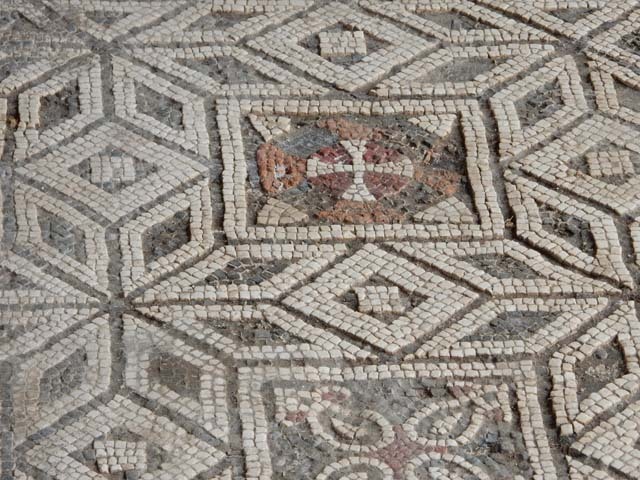 Room E, detail of coloured mosaic in doorway threshold in tablinum. 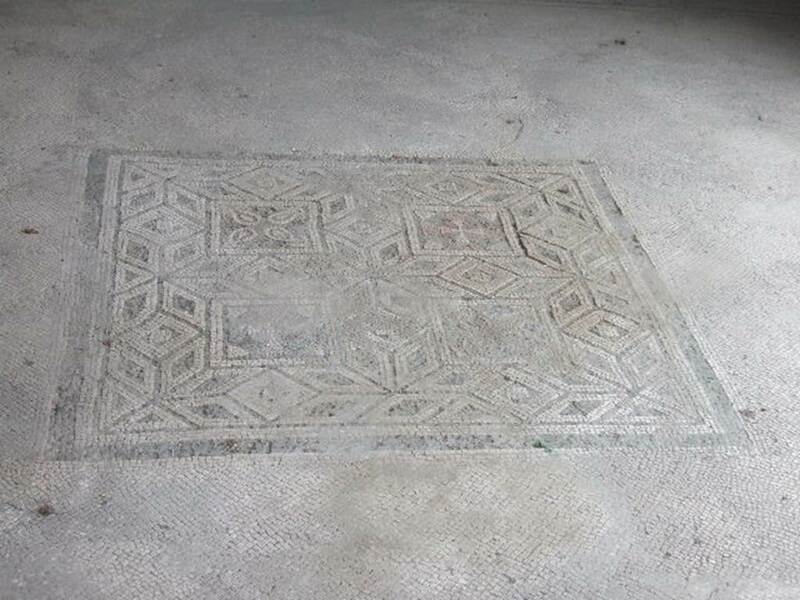 VI.16.7 Pompeii. May 2016. Room F, north-east corner of portico. Photo courtesy of Buzz Ferebee. 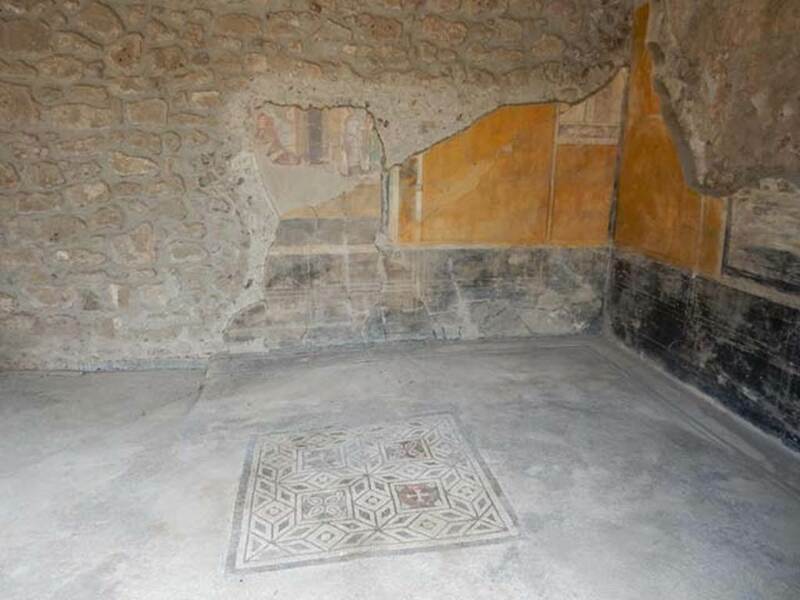 VI.16.7 Pompeii. May 2006. 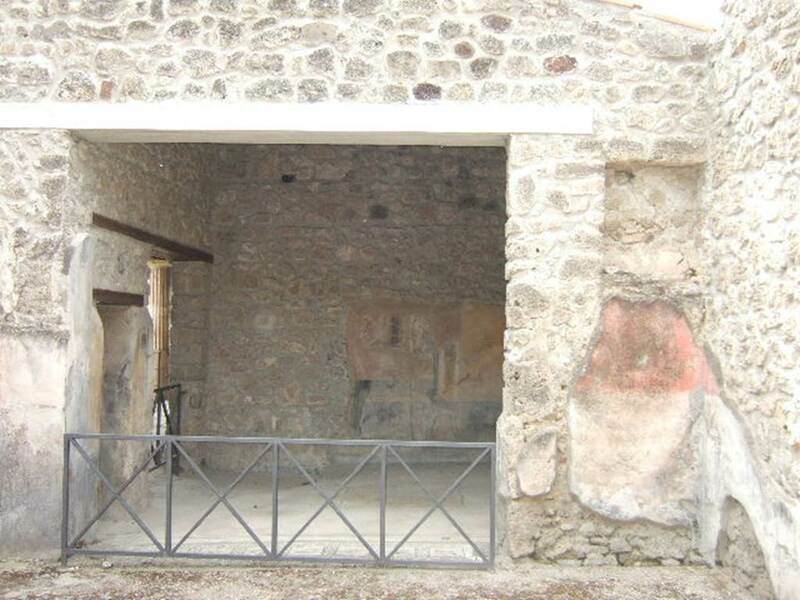 Room F, north-east corner of portico. VI.16.7 Pompeii. December 2004. 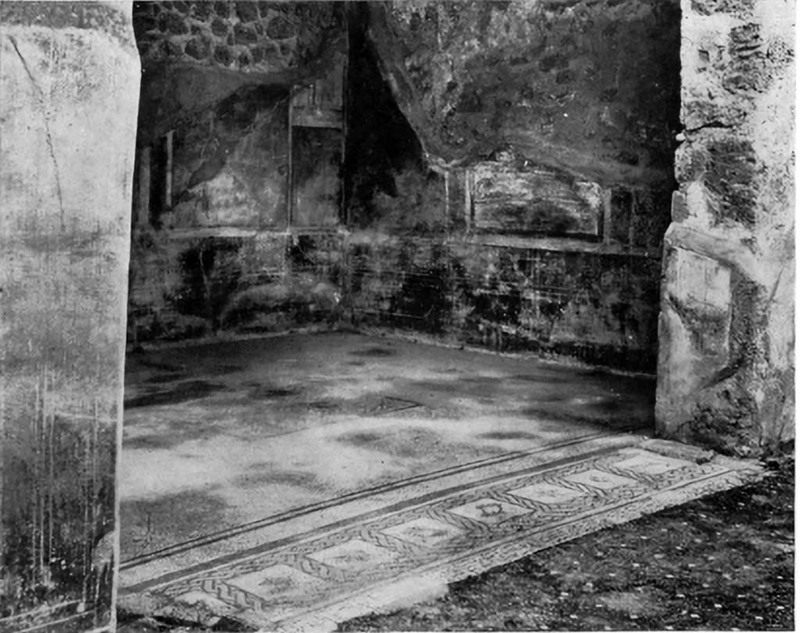 Room F, north-east corner of portico. VI.16.7 Pompeii. May 2016. 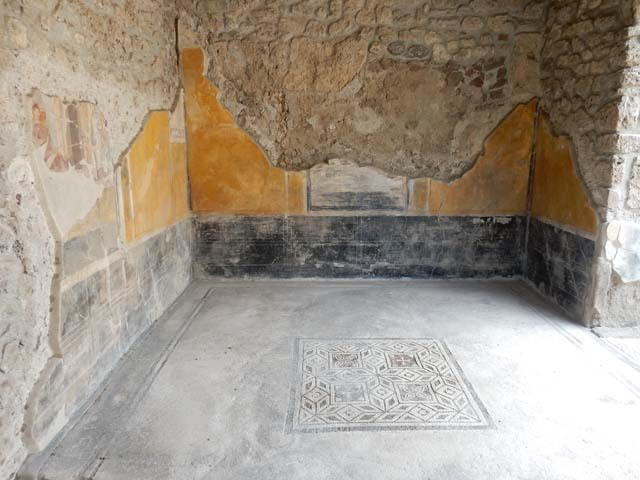 Room F, north-east corner of peristyle/garden. Photo courtesy of Buzz Ferebee. VI.16.7 Pompeii. May 2016. 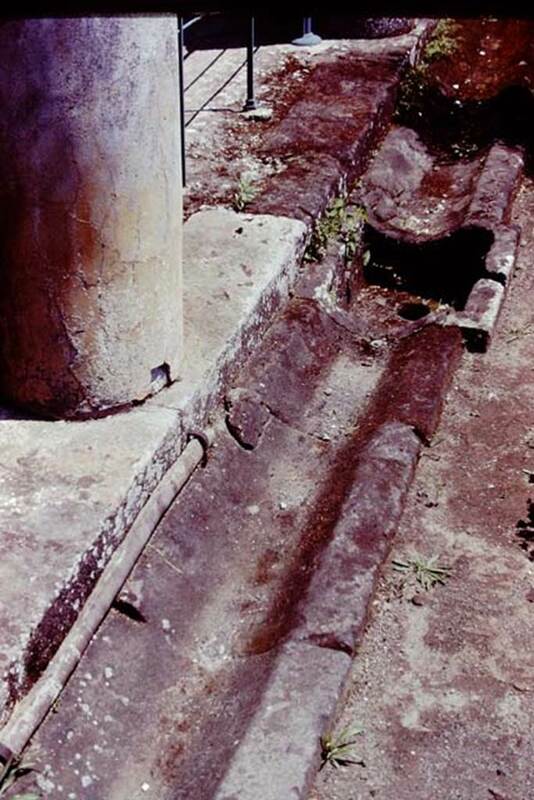 Room F, looking south along gutter with lead pipe on east side of peristyle/garden. VI.16.7 Pompeii, 1978. 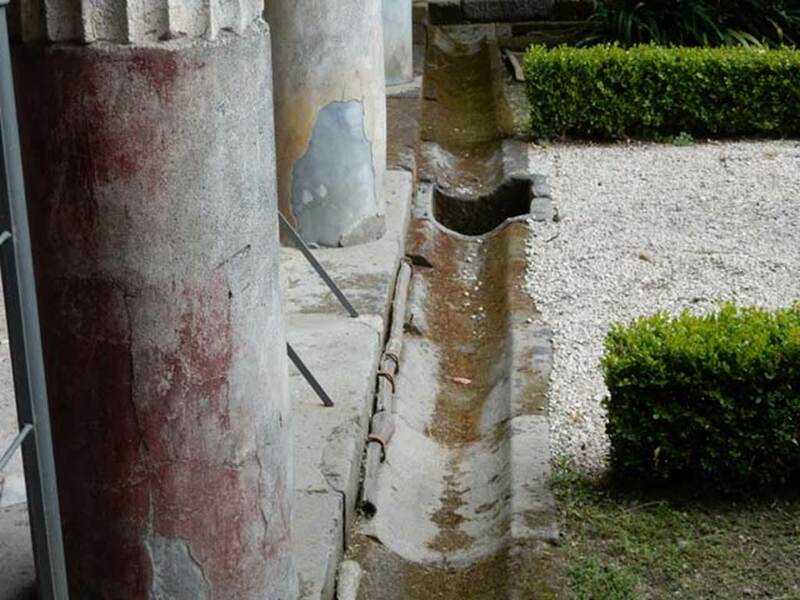 Room F. Lower part of column painted yellow, and gutter around edge of peristyle with lead pipe. VI.16.7 Pompeii. May 2016. Room F, looking west from east portico. Photo courtesy of Buzz Ferebee. 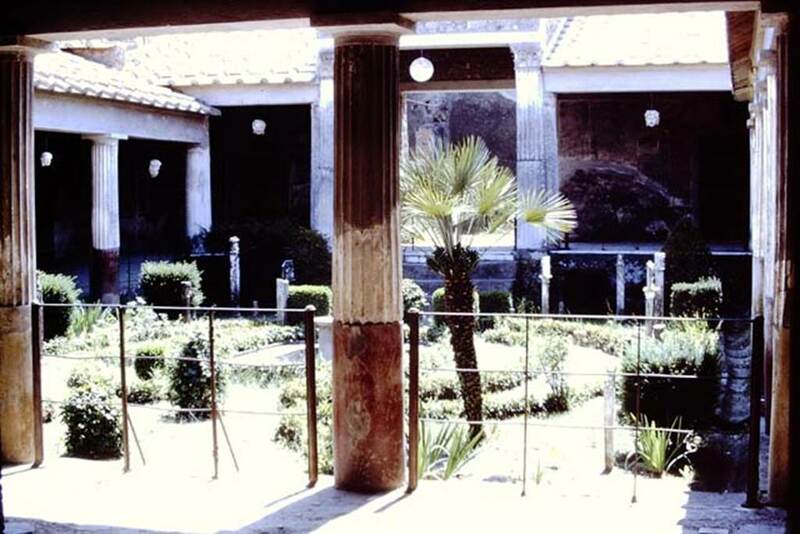 VI.16.7 Pompeii, 1968. Looking west across peristyle from east portico outside room G. Photo by Stanley A. Jashemski.